Designed for photographers passionate about wildlife – horses, bulls & birdlife – amateurs and professionals alike. It encompasses different shoots with the Wild White Horses running through the marsh and beach, the imposing Black Camargue Bulls thundering their way through the marsh with horns held high, stunning birdlife including the famous Pink Flamingos as they take flight in ‘V-formation’ at sunset. This workshop take place during the exciting Camargue Festival, filling your days with organised shoots, festival life and street photography with horses and bulls galloping through the streets of a walled mediaeval town at full throttle – exhilarating! An exciting combination for Wildlife, Streetlife and Equine photographers. We will collect you from the airport for transfer to your charming hotel in the centre of the medieval town of Aigues-Mortes. Take time to unwind, unpack and perhaps explore the streets of the city that lies within the mile-long rampart walls. We will gather for a welcome drink and briefing meeting. ‘Get to know you’ informal dinner at local bistro (optional). We start with traditional breakfast (a ‘casse-croûte’) in the meadow with the Gardians (Camargue cowboys) and locals, often in traditional Camargue dress. Standing in the shallow stream we are in the centre of the action to capture the Gardians rounding up the bulls to herd them into town for the Abrivado. Early afternoon capture festival life in and around the beautiful town of Aigues-Mortes, including bull racing; pop up theatre animation; good food and wine. At midday and in the evening there is a ball and concert on the main square with a full party atmosphere. In the afternoon, we photograph the Camargue Black bulls in action thundering their way through the marshy shallow water, their horns held high, herded by the Gardians on horseback – a unique photographic experience. We capture the Abrivado (the arrival) in Aigues-Mortes. The Gardians flank the bulls and arrive at a gallop, clattering through the streets in town. Each farm (mas) parades its bulls, herded by the cowboys on horseback. Young lads attempt, Toreador style, to get the better of the young bulls by distracting the horses – this is called the ‘Vachette’. Late afternoon it is time for the Bandido (the departure) – 2-3 cowboys flank one bull at a time as they gallop back through the narrow streets which is as exciting as dangerous and most people stay well behind the barriers. Once more the youngsters test their bravery by standing in the way as long as possible to destabilise the horses or catch the bull by the horns to enable him to escape. Capture stunning pictures of the horses and bulls as they gallop through the stone archways of the town with the sun setting behind them. At dawn, we photograph the stallions sparring – this is a unique opportunity to see the White horses entwined at full height, in feisty temperament with their manes flying! In the afternoon, we head for the Parc Ornithologique, which is a natural Camargue wetlands park of great importance. Led by our BBC Wildlife bird specialist and expert in his field, you will be taken to the ideal spots to get the birds at their very best. He knows the best hide-outs at the right time of the day to capture single birds perched on a tree or when to enjoy the vast lakes for flocks of pink Flamingos and the largest array of birdlife in Europe. At dawn, we return to the Parc Ornithologique where we have access before it opens to the public, allowing for exclusive shots as the Flamingos and birds fly in for the day. In the afternoon we photograph the Wild White horses running through the marsh and heading straight towards your cameras. We shoot several drives with the horses running across and towards your field of view. We will also take shots of the ‘Gardians’ dressed in their traditional Camargue shirts & hats, trident in hand, surrounded by the herd. At dawn, we head to the beach to photograph the black stallion running along the white sand and in and out of the sea – the black against the white of the beach and sea makes for a dramatic combination. Late afternoon, we get to capture the ultimate Camargue scene of the Wild White horses running through the surf along the beach with the sea spray flying. After the action, we then take single shots of the horses on their own with or without the ‘Gardians’. 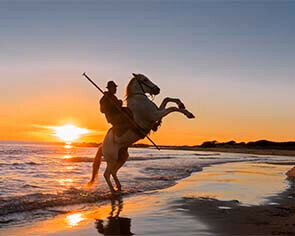 At dawn we head to the beach for a shoot with a single Stallion. We photograph him dashing and diving in and around the sea and surf, as well as on the top of the sand dunes, making for a wide range of dramatic action shots. Early afternoon departures to the airport. *For this workshop, Serge Krouglikoff is joined by specialist festival photographer, Daniel, who has been shooting this annual event for many years and will ensure you are in the right place at the right time to get the best shots.